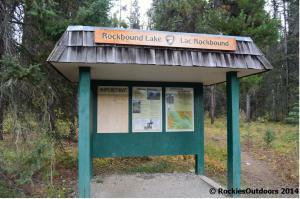 In my post ‘Ten Great Summer Hikes in the Canadian Rockies’ I mentioned hiking at Rockbound Lake in Banff National Park, so I thought I’d provide a few more photographs and a little bit more of an explanation about the hike. 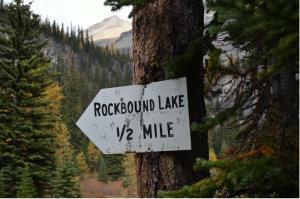 The trail head is a parking lot just east of Castle Junction on the Bow Valley Parkway. If you’re headed west on Highway 1 turn off at Castle Junction, towards the Bow Valley Parkway turn right to head back east and then it’s almost immediately on your left. I love the photo of the sign! Hope you make it to the top next time. I was thinking about hitting this trail this weekend. Do you think it’s still too early in the year for it? Unfortuantely I haven’t done it this year yet, so I’m not so sure about how it would be. Your best bet is to check the Parks Canada trail conditions report (http://www.pc.gc.ca/apps/tcond/cond_e.asp?opark=100092) or check in at the Banff Info Centre on Banff Ave.